Now that we are certain that NVIDIA’s latest upcoming graphics card will be the GeForce GTX 900 Series, thanks to the early listing of the product here, it’s time to know how good will these next generation Maxwell graphics cards will perform compared to its predecessors. 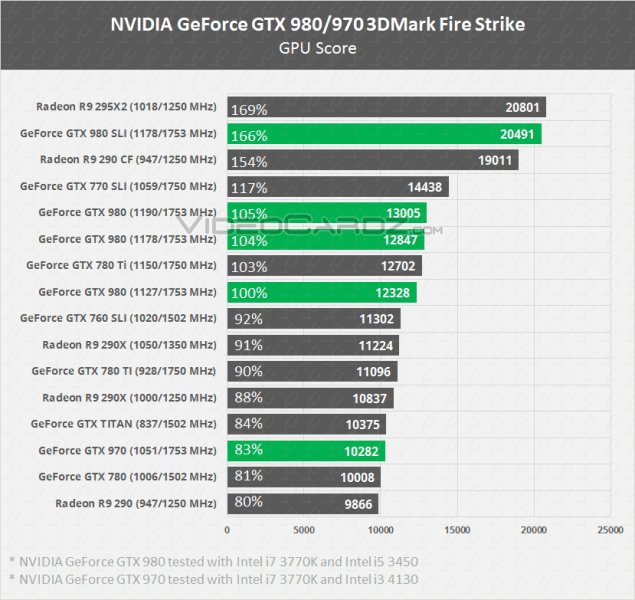 Videocardz.com recently posted some synthetic performance benchmark results of the NVIDIA GeForce GTX 980 and the GeForce GTX 970, as well as their SLI configurations. NVIDIA is full of surprises and it is still unclear whether the GTX 980 will outperform the GTX 780 Ti. Some reports claim that both cards are faster than their predecessors, while other reports claims that the GTX 980 will be faster than the GTX 780, but will not outperform the GTX 780 Ti. If Videocardz.com’s data are accurate, then I think I might have an idea why they say (NVIDIA_UK) that the GTX 980 may (or may not) outperform the GTX 780 Ti. NVIDIA GeForce GTX 980 Faster Than GeForce GTX 780 Ti? Looking at the graph above, you might notice that there are three different GeForce GTX 980 profiles, with clock speeds of 1127/1753MHz, 1178/1753MHz and 1190/1753MHz. My guess is, the first clock speed which is the 1127/1753MHz is the base clock, while the other two are factory overclock settings. The base setting is just below the GTX 780 Ti (OC), and honestly the GPU score difference is not that significant at all. This could mean that the base GTX 980 could perform on par with the GTX 780 Ti (OC). Now looking at the GTX 980 with higher clock speeds, it shows a slightly higher GPU score. Meaning at this point, the GTX 980 technically performed faster than the GTX 780 Ti (OC). It seems that there is an overlapping benchmark score, and the results depend on the clock speeds used. But it’s just too early to say that right now. We don’t know what are the final clock speeds of the GTX 980 and GTX 970 are. But I am still hoping that the GTX 980 will be indeed faster than the GTX 780 Ti, and will have better overclocking headroom. Remember this is just GPU score of the 3DMark Fire Strike benchmark test. Other benchmark tests might yield a different score, and real world gaming experience (4K or FHD) will definitely have a different result. Not to mention, drivers will also affect these results. Also note that the GeForce GTX 980 was tested together with an Intel Core i7-3770K and Intel i5-3450, while the GeForce GTX 970 was tested with a Core i7-3770K and Core i5-4130. Results may be different if the graphics cards were tested with the newer Intel Core i7-4790K Devil’s Canyon on a Z97 motherboard, or with the latest Haswell-E X99 systems. The NVIDIA GeForce GTX 980 and GTX 970 is expected to be unveiled on an event this coming September 19, 2014. So expect more leaks or information to be revealed in the following days to come. Asus Radeon R9 290 DirectCU II OC 4GB Review – Performance at the Right Price?